As a sponsor of MobiTechFest Boston, I am pleased to pass along this opportunity to help early stage startups. MobiTechFest in association with CTIA Enterprise & Applications™ is announcing an annual Wireless GameChanger™ Award to a mobile/wireless startup that is predicted to make a profound impact on the way, we live, work and communicate. MobiTechFest will select up to six global startups as showcased at our international conference series in 2011 and will allow them to present their game-changing innovation to a media audience of more than 400 people at the annual CTIA Enterprise & Applications™ 2011 in San Diego in October. For more information on how to apply to be considered as a presenter for MobiTechFest and on the Wireless GameChanger™ award, please visit http://www.investorfest.com/mobitechfest/americas/east/applytopresent. 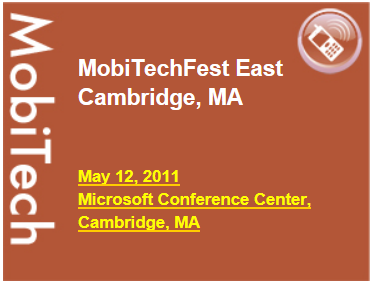 Remember, apply before April 20th to be considered for the first MobiTechFest showcase of 2011, in Boston on May 12th. Learn more at www.mobitechfest.com.